The PyTorch C++ frontend is a pure C++ interface to the PyTorch machine learning framework. While the primary interface to PyTorch naturally is Python, this Python API sits atop a substantial C++ codebase providing foundational data structures and functionality such as tensors and automatic differentiation. The C++ frontend exposes a pure C++11 API that extends this underlying C++ codebase with tools required for machine learning training and inference. This includes a built-in collection of common components for neural network modeling; an API to extend this collection with custom modules; a library of popular optimization algorithms such as stochastic gradient descent; a parallel data loader with an API to define and load datasets; serialization routines and more. This tutorial will walk you through an end-to-end example of training a model with the C++ frontend. Concretely, we will be training a DCGAN – a kind of generative model – to generate images of MNIST digits. While conceptually a simple example, it should be enough to give you a whirlwind overview of the PyTorch C++ frontend and wet your appetite for training more complex models. We will begin with some motivating words for why you would want to use the C++ frontend to begin with, and then dive straight into defining and training our model. Watch this lightning talk from CppCon 2018 for a quick (and humorous) presentation on the C++ frontend. This note provides a sweeping overview of the C++ frontend’s components and design philosophy. Documentation for the PyTorch C++ ecosystem is available at https://pytorch.org/cppdocs. There you can find high level descriptions as well as API-level documentation. Low Latency Systems: You may want to do reinforcement learning research in a pure C++ game engine with high frames-per-second and low latency requirements. Using a pure C++ library is a much better fit to such an environment than a Python library. Python may not be tractable at all because of the slowness of the Python interpreter. Highly Multithreaded Environments: Due to the Global Interpreter Lock (GIL), Python cannot run more than one system thread at a time. Multiprocessing is an alternative, but not as scalable and has significant shortcomings. C++ has no such constraints and threads are easy to use and create. Models requiring heavy parallelization, like those used in Deep Neuroevolution, can benefit from this. Existing C++ Codebases: You may be the owner of an existing C++ application doing anything from serving web pages in a backend server to rendering 3D graphics in photo editing software, and wish to integrate machine learning methods into your system. The C++ frontend allows you to remain in C++ and spare yourself the hassle of binding back and forth between Python and C++, while retaining much of the flexibility and intuitiveness of the traditional PyTorch (Python) experience. The C++ frontend is not intended to compete with the Python frontend. It is meant to complement it. We know researchers and engineers alike love PyTorch for its simplicity, flexibility and intuitive API. Our goal is to make sure you can take advantage of these core design principles in every possible environment, including the ones described above. If one of these scenarios describes your use case well, or if you are simply interested or curious, follow along as we explore the C++ frontend in detail in the following paragraphs. The C++ frontend tries to provide an API as close as possible to that of the Python frontend. If you are experienced with the Python frontend and ever ask yourself “how do I do X with the C++ frontend?”, write your code the way you would in Python, and more often than not the same functions and methods will be available in C++ as in Python (just remember to replace dots with double colons). Let’s begin by writing a minimal C++ application to verify that we’re on the same page regarding our setup and build environment. First, you will need to grab a copy of the LibTorch distribution – our ready-built zip archive that packages all relevant headers, libraries and CMake build files required to use the C++ frontend. The LibTorch distribution is available for download on the PyTorch website for Linux, MacOS and Windows. The rest of this tutorial will assume a basic Ubuntu Linux environment, however you are free to follow along on MacOS or Windows too. The note on Installing C++ Distributions of PyTorch describes the following steps in more detail. On Windows, debug and release builds are not ABI-compatible. If you plan to build your project in debug mode, we recommend building PyTorch from source. # If you need e.g. CUDA 9.0 support, please replace "cpu" with "cu90" in the URL below. While CMake is the recommended build system for LibTorch, it is not a hard requirement. You can also use Visual Studio project files, QMake, plain Makefiles or any other build environment you feel comfortable with. However, we do not provide out-of-the-box support for this. Looks like an identity matrix to me! Now that we have our basic environment configured, we can dive into the much more interesting parts of this tutorial. First, we will discuss how to define and interact with modules in the C++ frontend. We’ll begin with basic, small-scale example modules and then implement a full-fledged GAN using the extensive library of built-in modules provided by the C++ frontend. In line with the Python interface, neural networks based on the C++ frontend are composed of reusable building blocks called modules. There is a base module class from which all other modules are derived. In Python, this class is torch.nn.Module and in C++ it is torch::nn::Module. Besides a forward() method that implements the algorithm the module encapsulates, a module usually contains any of three kinds of sub-objects: parameters, buffers and submodules. Parameters and buffers store state in form of tensors. Parameters record gradients, while buffers do not. Parameters are usually the trainable weights of your neural network. Examples of buffers include means and variances for batch normalization. In order to re-use particular blocks of logic and state, the PyTorch API allows modules to be nested. A nested module is termed a submodule. Parameters, buffers and submodules must be explicitly registered. Once registered, methods like parameters() or buffers() can be used to retrieve a container of all parameters in the entire (nested) module hierarchy. Similarly, methods like to(...), where e.g. to(torch::kCUDA) moves all parameters and buffers from CPU to CUDA memory, work on the entire module hierarchy. Just like in Python, we define a class called Net (for simplicity here a struct instead of a class) and derive it from the module base class. Inside the constructor, we create tensors using torch::randn just like we use torch.randn in Python. One interesting difference is how we register the parameters. In Python, we wrap the tensors with the torch.nn.Parameter class, while in C++ we have to pass the tensor through the register_parameter method instead. The reason for this is that the Python API can detect that an attribute is of type torch.nn.Parameter and automatically registers such tensors. In C++, reflection is very limited, so a more traditional (and less magical) approach is provided. You can find the full list of available built-in modules like torch::nn::Linear, torch::nn::Dropout or torch::nn::Conv2d in the documentation of the torch::nn namespace here. The documentation for torch::nn::Module contains the full list of methods that operate on the module hierarchy. At this point, we know how to define a module in C++, register parameters, register submodules, traverse the module hierarchy via methods like parameters() and finally run the module’s forward() method. While there are many more methods, classes and topics to devour in the C++ API, I will refer you to docs for the full menu. We’ll also touch upon some more concepts as we implement the DCGAN model and end-to-end training pipeline in just a second. Before we do so, let me briefly touch upon the ownership model the C++ frontend provides for subclasses of torch::nn::Module. For this discussion, the ownership model refers to the way modules are stored and passed around – which determines who or what owns a particular module instance. In Python, objects are always allocated dynamically (on the heap) and have reference semantics. This is very easy to work with and straightforward to understand. In fact, in Python, you can largely forget about where objects live and how they get referenced, and focus on getting things done. For the second case – reference semantics – we can use std::shared_ptr. The advantage of reference semantics is that, like in Python, it reduces the cognitive overhead of thinking about how modules must be passed to functions and how arguments must be declared (assuming you use shared_ptr everywhere). In order to use the linear submodule, we want to store it directly in our class. However, we also want the module base class to know about and have access to this submodule. For this, it must store a reference to this submodule. At this point, we have already arrived at the need for shared ownership. Both the torch::nn::Module class and concrete Net class require a reference to the submodule. For this reason, the base class stores modules as shared_ptrs, and therefore the concrete class must too. There is one subtle issue that deserves mention here. A default constructed std::shared_ptr is “empty”, i.e. contains a null pointer. What is a default constructed Linear or Net? Well, it’s a tricky choice. We could say it should be an empty (null) std::shared_ptr<LinearImpl>. However, recall that Linear(3, 4) is the same as std::make_shared<LinearImpl>(3, 4). This means that if we had decided that Linear linear; should be a null pointer, then there would be no way to construct a module that does not take any constructor arguments, or defaults all of them. For this reason, in the current API, a default constructed module holder (like Linear()) invokes the default constructor of the underlying module (LinearImpl()). If the underlying module does not have a default constructor, you get a compiler error. To instead construct the empty holder, you can pass nullptr to the constructor of the holder. In conclusion: Which ownership model – which semantics – should you use? The C++ frontend’s API best supports the ownership model provided by module holders. The only disadvantage of this mechanism is one extra line of boilerplate below the module declaration. That said, the simplest model is still the value semantics model shown in the introduction to C++ modules. For small, simple scripts, you may get away with it too. But you’ll find sooner or later that, for technical reasons, it is not always supported. For example, the serialization API (torch::save and torch::load) only supports module holders (or plain shared_ptr). As such, the module holder API is the recommended way of defining modules with the C++ frontend, and we will use this API in this tutorial henceforth. We now have the necessary background and introduction to define the modules for the machine learning task we want to solve in this post. 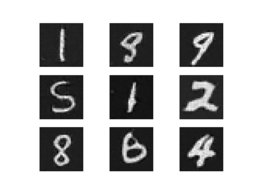 To recap: our task is to generate images of digits from the MNIST dataset. We want to use a generative adversarial network (GAN) to solve this task. In particular, we’ll use a DCGAN architecture – one of the first and simplest of its kind, but entirely sufficient for this task. You can find the full source code presented in this tutorial in this repository. A GAN consists of two distinct neural network models: a generator and a discriminator. The generator receives samples from a noise distribution, and its aim is to transform each noise sample into an image that resembles those of a target distribution – in our case the MNIST dataset. The discriminator in turn receives either real images from the MNIST dataset, or fake images from the generator. It is asked to emit a probability judging how real (closer to 1) or fake (closer to 0) a particular image is. Feedback from the discriminator on how real the images produced by the generator are is used to train the generator. Feedback on how good of an eye for authenticity the discriminator has is used to optimize the discriminator. In theory, a delicate balance between the generator and discriminator makes them improve in tandem, leading to the generator producing images indistinguishable from the target distribution, fooling the discriminator’s (by then) excellent eye into emitting a probability of 0.5 for both real and fake images. For us, the end result is a machine that receives noise as input and generates realistic images of digits as its output. A Sequential module simply performs function composition. The output of the first submodule becomes the input of the second, the output of the third becomes the input of the fourth and so on. The particular modules chosen, like nn::Conv2d and nn::BatchNorm, follows the structure outlined earlier. The kNoiseSize constant determines the size of the input noise vector and is set to 100. Notice also that we use the torch::nn::Functional module for our activation functions, passing it torch::relu for inner layers and torch::tanh as the final activation. Hyperparameters were, of course, found via grad student descent. The Python frontend has one module for each activation function, like torch.nn.ReLU or torch.nn.Tanh. In C++, we instead only provide the Functional module, to which you can pass any C++ function that will be called inside the Functional’s forward() method. No grad students were harmed in the discovery of hyperparameters. They were fed Soylent regularly. Whichever approach we use, we can now invoke forward() on the Generator to map a noise sample to an image. A brief word on the way options are passed to built-in modules like Conv2d in the C++ frontend: Every module has some required options, like the number of features for BatchNorm. If you only need to configure the required options, you can pass them directly to the module’s constructor, like BatchNorm(128) or Dropout(0.5) or Conv2d(8, 4, 2) (for input channel count, output channel count, and kernel size). If, however, you need to modify other options, which are normally defaulted, such as with_bias for Conv2d, you need to construct and pass an options object. Every module in the C++ frontend has an associated options struct, called ModuleOptions where Module is the name of the module, like LinearOptions for Linear. This is what we do for the Conv2d modules above. When the function we pass to Functional takes more arguments than a single tensor, we can pass them to the Functional constructor, which will forward them to each function call. For the leaky ReLU above, this means torch::leaky_relu(previous_output_tensor, 0.2) is called. Now that we have defined the generator and discriminator model, we need some data we can train these models with. The C++ frontend, like the Python one, comes with a powerful parallel data loader. This data loader can read batches of data from a dataset (which you can define yourself) and provides many configuration knobs. While the Python data loader uses multi-processing, the C++ data loader is truly multi-threaded and does not launch any new processes. A library of existing datasets, transforms and samplers. Note that the MNIST dataset should be located in the ./mnist directory relative to wherever you execute the training binary from. You can use this script to download the MNIST dataset. The type returned by the data loader in this case is a torch::data::Example. This type is a simple struct with a data field for the data and a target field for the label. Because we applied the Stack collation earlier, the data loader returns only a single such example. If we had not applied the collation, the data loader would yield std::vector<torch::data::Example<>> instead, with one element per example in the batch. Which means we are successfully able to load data from the MNIST dataset. As of this writing, the C++ frontend provides optimizers implementing Adagrad, Adam, LBFGS, RMSprop and SGD. The docs have the up-to-date list. // Train discriminator with real images. // Train discriminator with fake images. Above, we first evaluate the discriminator on real images, for which it should assign a high probability. For this, we use torch::empty(batch.data.size(0)).uniform_(0.8, 1.0) as the target probabilities. We pick random values uniformly distributed between 0.8 and 1.0 instead of 1.0 everywhere in order to make the discriminator training more robust. This trick is called label smoothing. Before evaluating the discriminator, we zero out the gradients of its parameters. After computing the loss, we back-propagate through the network by calling d_loss.backward() to compute new gradients. We repeat this spiel for the fake images. Instead of using images from the dataset, we let the generator create fake images for this by feeding it a batch of random noise. We then forward those fake images to the discriminator. This time, we want the discriminator to emit low probabilities, ideally all zeros. Once we have computed the discriminator loss for both the batch of real and the batch of fake images, we can progress the discriminator’s optimizer by one step in order to update its parameters. To train the generator, we again first zero its gradients, and then re-evaluate the discriminator on the fake images. However, this time we want the discriminator to assign probabilities very close to one, which would indicate that the generator can produce images that fool the discriminator into thinking they are actually real (from the dataset). For this, we fill the fake_labels tensor with all ones. We finally step the generator’s optimizer to also update its parameters. // Place this somewhere at the top of your training script. If a tensor already lives on the device supplied to to(), the call is a no-op. No extra copy is made. The last augmentation we should make to our training script is to periodically save the state of our model parameters, the state of our optimizers as well as a few generated image samples. If our computer were to crash in the middle of the training procedure, the first two will allow us to restore the training state. For long-lasting training sessions, this is absolutely essential. Fortunately, the C++ frontend provides an API to serialize and deserialize both model and optimizer state, as well as individual tensors. // Checkpoint the model and optimizer state. // Sample the generator and save the images. where kCheckpointEvery is an integer set to something like 100 to checkpoint every 100 batches, and checkpoint_counter is a counter bumped every time we make a checkpoint. CUDA is available! Training on GPU. Digits! Hooray! Now the ball is in your court: can you improve the model to make the digits look even better? This tutorial has hopefully given you a digestible digest of the PyTorch C++ frontend. A machine learning library like PyTorch by necessity has a very broad and extensive API. As such, there are many concepts we did not have time or space to discuss here. However, I encourage you to try out the API, and consult our documentation and in particular the Library API section when you get stuck. Also, remember that you can expect the C++ frontend to follow the design and semantics of the Python frontend whenever we could make this possible, so you can leverage this fact to increase your learning rate. As always, if you run into any problems or have questions, you can use our forum or GitHub issues to get in touch. What was a GAN aGAN? To analyze traffic and optimize your experience, we serve cookies on this site. By clicking or navigating, you agree to allow our usage of cookies. As the current maintainers of this site, Facebook’s Cookies Policy applies. Learn more, including about available controls: Cookies Policy.